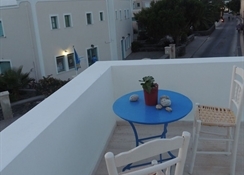 The family-run Santo Rose is located in Kamari Village of Santorini, within a 2-minutes walk from the beach and a short walk from restaurants and shops. It offers studios with a balcony overlooking the mountain. Santo Rose lies within 7 km from the lively Fira capital and 10 km from Ormos Athinios Port Santorini National Airport is 55 km away. Free public parking can be found nearby. Kamari is a famous beach resort of Santorini situated 10 km southeast of Fira, the island's capital. Quite similar to the landscape of Perissa, the beach is covered by black sand while on the left side of the beach is an enormous rock called Mesa Vouno that rises from the sea. The area is extremely attractive, especially at night when the rock shines in the dark. The beach of Kamari is fully organised offering a wide range of facilities like sunbeds, umbrellas and various types of water sports. The traditional houses line the village of Kamari offering a beautiful view to the sea. Visitors can take a nice walk along the waterfront. Due to the modern amenities including hotels, restaurants, snacks, cafes, bars and night clubs the village becomes quite popular with tourists during the peak season. Each unit is spacious on a mix of mordern/traditional decoration that can accommodate every guests' need. Ideal for both families and young people.